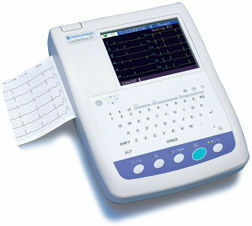 A key feature of the 1250A electrocardiograph is its large color screen (in an otherwise small package) for the viewing of all 12-leads simultaneously, with keyboard for patient data entry, interpretation, forty patient internal memory (optional flash card extended memory), USB communication output, built-in ECG waveform generator (for ease of trouble shooting and over-the-phone training), standard high-resolution four column by three row with a rhythm strip at the bottom print out, with the patient demographic information, measurements, and interpretation on a folding following sheet. An internal rechargeable battery is also included. Warranty = 4-years (with the return of the enclosed warranty card). The compact design requiring minimal table surface for use and storage makes it convenient for offices with limited space. Large Backlit Color LCD display facilitates data review. Alphanumeric keyboard allow for easy patient data entry.